The Tectite TMV utilises the latest innovations in metal push-fit technology and will provide connectivity to copper, stainless steel and PE-X and PB. It also benefits from additional push-fit advantages such as installed cost savings, as joints are made in a fraction of the time, heat free therefore no requirement for a hot works permit and rotatable joints which makes working in confined spaces easier. The TMV itself carries with it the high performance guarantee by Pegler Yorkshire products. The Tectite TX405 series in-line TMVs are combined TMV3 and TMV2 compact mixing valves which meet the requirements of NHS Model Engineering Specification DO8, are third party approved through Buildcert. They also meet EN1111 and EN1287 standard allowing them to be used in domestic bath fill applications for new build properties in line with the mandatory requirements of Part G of the Building Regulations 2010. 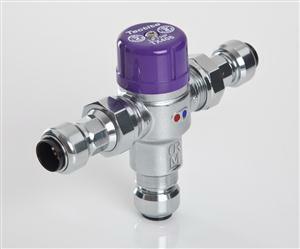 The new valves are fitted with a single purple cap which includes the TMV3 and TMV2 logos that provides a clear visual indication that the valve can be used in a variety of applications such as hospitals, care homes and domestic use. For installers and contractors, the new valves retain the ease of service advantages and now also offer Tectite connection for pipe sizes 15mm to 22mm. The full Tectite TMV series are supplied with strainers and non-return valves, they offer a screw fixed tamper proof cap to prevent unauthorised adjustment of the valve temperature setting which is factory pre-set to 43C and come with easy to service union connections. Pegler Yorkshire is well known and respected as one of the leading manufacturers of advanced plumbing, heating and engineering products in the world. It’s a reputation earned through a total dedication to quality, innovation and customer service that’s been the hallmark of the company since it was established in the 1890’s (originally trading as Pegler Ltd and Yorkshire Fittings Ltd).